PEANUT, VEGETABLE OIL, salt. May contain traces of SESAMEand SEEDS and NUTS. Peanuts have natural ability so that the kernels absorb inherently high levels of fat during roasting process, in addition, we also give to the preparation process a great importance to the salt content, with which we spice up our PEANUTS CLASSIC, very carefully tuned so that our peanut kernels are not too salty, but simply delicious. A natural delicacy that we create the great flavour with a few simple steps. The classic naturalness of our peanuts is helped us to give you your own personal favourite peanut snack. Classic peanuts with a hint of sea salt - just mmmhhh delicious. The wheel we certainly have not reinvented. But we have made a special effort selecting the ingredients for our CLASSIC PEANUTS and we put a special attention to the particularly nutty flavour, combined with just the right amount of mineral sea salt, which makes our peanuts so delicately spicy, it promises high-quality snack, a balanced blend of flavour and seasonings. 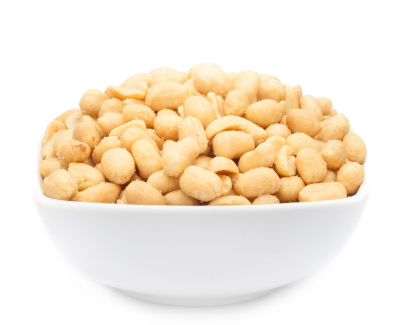 Just as many generations of people loves this snack for a long time and bring with them the delicious little nut kernels in a relaxing evening at the bar or in front of the television, like also in the company of friends. A snack that is appreciated and loved. That is our target. It dosen't always have to be the classic night, with your friends at the bar. It doesn't need to be a new movie at the cinema. Our CLASSIC PEANUTS are a pure crunchy treat who needs absolutely no reason and doesn't need any complicated situation to have it. Usually not the really big moments in life is what it's counting, are the little ones that with enjoyment and completely spontaneous make our experiences to matter. As a little refreshment in life, if it is to be anything big, but just a little taste tickling: Grab it ! Give yourself a treat and enjoy a small, salty-nutty flavour moment and let it go well for you. Just for the fun of it!